Yunnan means literally Clouds south, and it is an appropriate name because warm tropical air from the south is funneled up the narrow steep valleys giving them rich and exotic vegetation in the mist laden air. Yunnan remains a popular tourist destination that is somewhat off the beaten track. 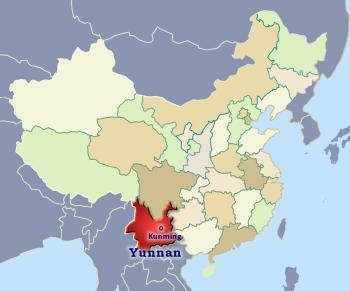 Yunnan's position on the mountain borders of Vietnam; Laos and Burma (Myanmar) have made it the refuge of many different tribes of people including Hui; Tibetan; Miao; Yi; Zhuang; Yao; Bai; Hani; Jinuo; Nu and Dai (among others) all with their own languages and traditions. They hold their own festivals too : March Fair ➚ of the Bai people; Water-splashing Festival ➚ of the Dai people and the Torch Festival ➚ of the Yi people. Kunming's lofty height and low latitude at 6,214 feet [1,894 meters] makes it pleasantly warm all year round (82 ° F [28 ° C]). The provincial capital is on an ancient trail to India. WuHua Shan (Five Flower Hill) near the center has traditional temples and houses. In the late 19th century the area came under strong French influence and a railway was built from French run Hanoi. Lake Dian ➚ is overlooked by Daguan (Grand View) Hall on the western outskirts of the city; and is one of the largest freshwater lakes in China. To the west Xi Shan (Western Hills) offers a steep climb of 1,333 steps cut into a cliff. There are several temples and pavilions on the way to the top with impressive views over Lake Dian. Lake Dian has many fishing villages along its banks and there are hot springs on the eastern shore. Qiongzhu (Bamboo) Temple ➚ is the most famous in Yunnan dating back to the 13th century. Kunming also boasts Jindian (Golden Hall) built in 1671, although it is actually built entirely in bronze rather than gold. Nearby are camellias 600 years old. Yuantong Temple is a Buddhist pilgrimage site. The Stone Forest at Shilin ➚ to the south-east is a popular tourist destination full of gray limestone pillars the size of tree trunks. The Peak Viewing Pavilion provides a panoramic view of the extensive area. Sani ethnic people act as guides and celebrate festivals mainly for the benefit of tourists. Xiaguan ➚ (Dali) is an important town on the former Burma Road ➚ link into China and the main road to Tibet. It is famous for its Three Pagodas (Dali Santa). Er Hai (Ear lake) is picturesque with fishermen using tame cormorants to catch fish. Lijiang ➚ is a popular tourist spot, made famous by a British documentary series called Beyond the Clouds ➚; it is at a high altitude 8,530 feet [2,600 meters] and home to Nakhi (Naxi) minority people ➚. The Naxi are rare as a matriarchal society - the women own all the land. The impressive gorge of the Jinsha (Golden Sands river, better known as Yangzi) River is one of many sights to be seen in Yunnan. The Golden Sands River was where the Communist Army crossed the Yangzi during the Long March. Further downstream, the town of Dukou (Panzhihua) marks the navigable limit of the Yangzi (Chang Jiang) river. Zhongdian ➚ in northern Yunnan has renamed itself ‘Shangrila’ to reflect an association with James Hilton ➚'s famous novel about a paradise hidden in the mountains. Nearby the Jinsha Jiang (headwaters of the Yangzi) narrows at the famous Tiger Leaping Gorge ➚. However, the more likely setting for the fabled city of Shangri-la ➚ is the sacred mountain Kawagarbo ➚ 22,113 feet [6,740 meters] on the Tibetan border near Deqin ➚ and sacred to Tibetan Buddhists. In the far south of Yunnan is Xishuang Banna ➚ near Jinghong, a gem of a nature reserve containing China's only tropical rain forest. For thousands of years there have been a variety of mountain people living in the luxuriant forest. The steep mountain sides have protected the area from cultivation (except for a few rubber plantations). Many exotic and rare plants grow here together with a range of different species of monkey and also elephants. Some of China's only active volcanoes are in the far west - the Tengchong Volcanoes ➚. Close by in Menghai is an ancient Buddhist temple and pagoda ➚. Gejiu ➚ in southern Yunnan is well known for its tin; copper and lead mines. It was the extensive tin deposits that brought the interest of European powers to the area (particularly France) in the nineteenth century. Evidence from archeological finds from Yuanmou ➚ take the story of hominid habitation back 1.7 million years. After conquest by China in the Han dynasty, Yunnan became independent again as part of the Nanzhao Kingdom ➚ and then the Kingdom of Dali ➚, it did not become fully integrated into China until the Yuan dynasty (13th century). In the 19th century it became a target for the expansionist ambitions of the French Indo-Chinese Empire but the plan never quite came to fruition. A long rebellion by Muslim leader Du Wenxiu ➚ 1858-73 led to much bloodshed. Yunnan was the first province to rebel against Yuan Shikai's proclamation as Emperor in 1916. 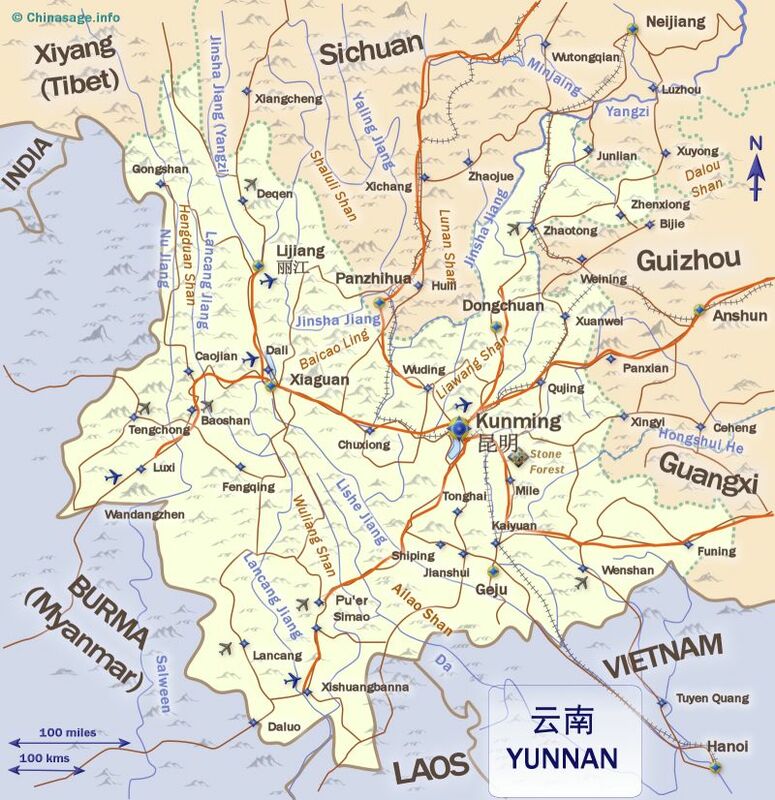 During the Second World War the Burma Road cut through the Yunnan mountains to Kunming and then on to Chongqing, bringing vital supplies to the besieged city, then the capital of Nationalist Free China. There were resistance to Communist rule in the early years of the PRC, at times fueled by the growing of opium in the valleys which the Communists had banned. Yunnan has pockets of rich farmland among the forests on the steeper slopes where tobacco is an important crop. 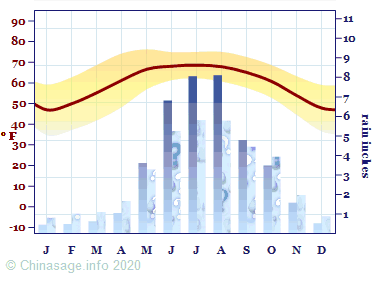 Warm summers; frost free winters and moderate rainfall makes it ideal for crop growing but only on the very limited areas of flat land along the many river valleys. The deep valleys that cut north-south through the province make travel very difficult, the roads having to frequently double back. Industry is concentrated around the capital Kunming. The province has great scenic beauty making it an increasingly popular tourist attraction throughout the year. Citation information for this page : Chinasage, 'Yunnan, China', last updated 4 Dec 2018, Web, http://www.chinasage.info/maps/yunnan.htm.